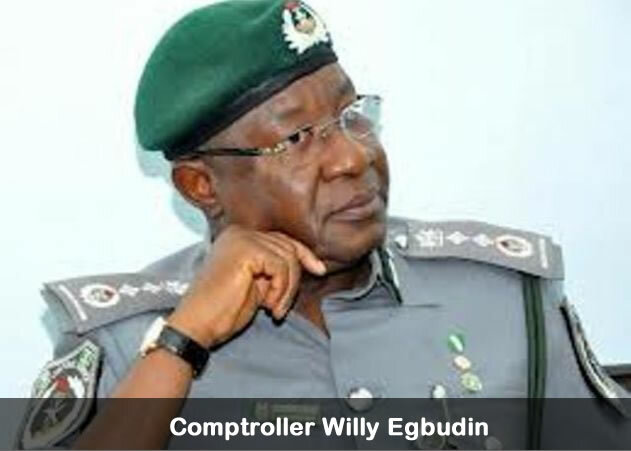 Comptroller Willy Egbudin, Customs Area Controller of Seme Area Command of the Nigeria Customs Service has urged newly promoted officers under the command to redouble their efforts in the service to the nation. Egbudin said this while formally decorating some promoted officers with their new badges of rank at the conference room of the command headquarters in Seme Border where he also admonished all other operatives of the command to keep the fight against smuggling up. ”I want to tell you today that it is of utmost importance for us to justify the confidence reposed on us by the Comptroller General of Customs, Dr. Abdullahi Dikko Inde CFR and members of his management team” Egbudin told a cheering gathering of officers and guests. He continued, ” Promotion is a trust which the nation has bestowed on us and this is indeed a very happy day for all of us. I also wish to tell others who may not have benefited from this particular promotion exercise to keep hope alive as the management is doing everything possible to improve staff welfare.” He extolled the concern of the Comptroller General for staff welfare. A total number of 193 officers were promoted in the recent elevation exercise.Among those promoted are, 2 Deputy Comptrollers, 2 Assistant Comptrollers, 12 Chief Superintendent of Customs and 6 Superintendent of Customs including Ernest Olottah, the Command’s Public Relations Officer(CPRO). Olottah an alumnus of the prestigious University of Abuja holds a Bachelor of Science Degree in Political Science. He is a multiple award winning Public Relations Officer and a member of the Nigerian Institute of Public Relations (NIPR). He has served in various commands including Murtala Muhammmed Airport Command, Ogun State, Headquarters and Seme Border. Other areas he served are Niger, Kwara and Rivers State. He has also served as Board member Customs Immigration and Prisons Pension Board (CIPPO). Responding on behalf of the newly promoted officers, Idris Lecky a Chief Superintendent of Customs commended the customs management and pledged the preparedness of the officers to redouble their performance in line with the promotion.